From luxury waterfront homes to spacious country dwellings, Horseshoe Bay real estate offers something for just about anyone. This resort community is especially appealing to retirees looking to enjoy the fruits of their lifetime of labor. For quiet and refined elegance, Horseshoe Bay is unmatched, and Josette is eager to show you why this if one of the best places to live in all of Texas. Horseshoe Bay, Texas is located at the southern end of Lake Lyndon B Johnson. It was just incorporated as a city in 2005, and it has about 3,500 residents. Owners of Horseshoe Bay real estate enjoy the dynamic combination of Hill Country scenery, water-based recreational activities, and proximity to Austin and San Antonio. The community is a popular resort destination. It offers a readily accessible getaway for residents of Austin and San Antonio and a diverse lineup of real estate options for home buyers. Those wanting a simple weekend escape can look at the condominiums and modest-sized ranches available in the area. At the same time a home buyer can choose from among numerous luxury waterfront estates. Horseshoe Bay homes for sale range in size to as large as 10,000 sq. ft.
For those interested in open land on which to build a dream home or a vacation retreat, Horseshoe Bay offers numerous options. One can find everything from modest quarter-acre developed lots to multi-acre lakefront Horseshoe Bay properties. Real estate in Horseshoe Bay includes mid-rise condominium buildings that offer units with terrific water views. One can also look at homes for sale in Horseshoe Bay in planned communities like Summit Rock. This newer 1,600 acre development includes a Jack Nicklaus signature championship golf course and the new Tuscan Village that provides resort living for adults 55+. Horseshoe Bay Golf Resort Horseshoe Bay, Texas is home to the resort of the same name. This widely acclaimed Horseshoe Bay Resort offers 54 holes of championship golf. 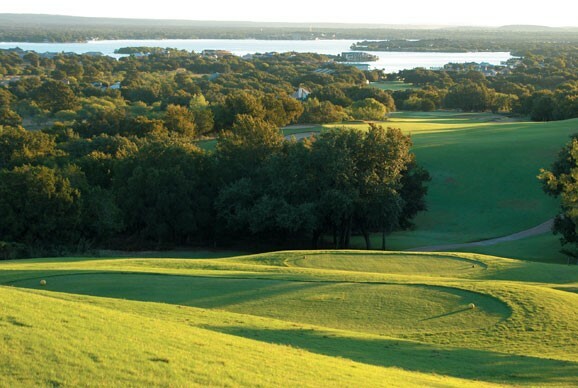 The Slick Rock, Ram Rock, and Applerock golf courses were all designed by famous golf course architect Robert Trent Jones, Sr.
Lake LBJ offers excellent fishing for avid fishermen. Water skiing, wave boarding, wind surfing, and boating are popular activities. At the Lake LBJ Yacht Club and Marina, one can rent a host of different watercraft, including jet skis. There are a number of wineries in this part of the Texas Hill Country. As a result, residents can enjoy wine-tasting events and winery tours. Lake LBJ even has cruises that sometimes include wine-tasting experiences. Nearby Marble Falls has a restored historic Main Street District that includes fine dining, interesting boutique shops, a theater, and a farmers market. Owners of Horseshoe Bay homes will never tire of all the diverse opportunities. Live music is regularly scheduled right on the waterfront at Horseshoe Bay Resort. Fishing tournaments take advantage of the crappies, white bass, and trophy-size largemouths found in the lake. The upscale community of Horseshoe Bay offers larger than life amenities and a vibrant lifestyle, all in a modern Texas setting. If you're ready to find out more about Horseshoe Bay real estate and find your own piece of paradise, call Josette today and let her put her experience to work for you.